A rare chance to acquire a piece of rural Clarence history is being offered with the sale of “Southgate”, 602 Lawrence Road, Grafton. This substantial property of approximately 49 hectares (121 acres) is located on the highly sought-after Great Marlow flood plains just six kilometres from Grafton City. Featuring a beautifully restored and renovated home, the circa 1925 Federation design provides the charming aesthetics of period style with the comforts of contemporary living. Ceilings are an impressive 13-feet high, original pressed metal showcasing the space overhead while polished floors throughout provide warmth and practical uniformity. The recently renovated kitchen and large bathroom will appeal to the demands of modern life. A large formal lounge room with its inviting open fireplace is what period living is all about. The media room also features an enclosed fire heater while the elegant dining room is the perfect setting for intimate dinner parties. The home has an office/store room which could easily serve as a fourth bedroom. There is also a handy outside toilet. On the southern side of the home, a long enclosed veranda (1.8 x 15m) is perfect for storage incorporating a practical utility area. If you have dogs, a large fenced area close to the home complete with doggy door should keep them happy. Chickens are also catered for with a large lock-up house so your egg-laying friends can make themselves comfortable while they get to work. If outdoor entertaining is your thing Southgate’s huge summer rear veranda (54sqm) will be paradise. With oodles of cupboards, an enclosed double door fridge/freezer, and large barbecue you will be in hospitality heaven as you and your guests enjoy a drink overlooking the stunning expanse of land that wraps around this slice of rural gold. In winter you can soak up the sun for most of the day on the home’s wide front veranda while you watch the world pass by. The extensive grounds boast beautiful shade trees providing many options when it comes to sitting out in nature with a good book and coffee. The property offers scope for a diverse farming income whether you want to carry bullocks, cows and calves and/or horses, boasting three main paddocks with a central lane way for ease of mustering. All paddocks are connected to mains water and have cement troughs. Fencing on the property is in A1 condition, with mains electric fencing around six horse paddocks. Three of which have double shelters. There is good sized timber and galvanised pipe in the cattle yards which easily hold 80 head of mature cattle with steel crush, steel calf race and crush plus a large new loading ramp for cattle and horses for easy transportation. 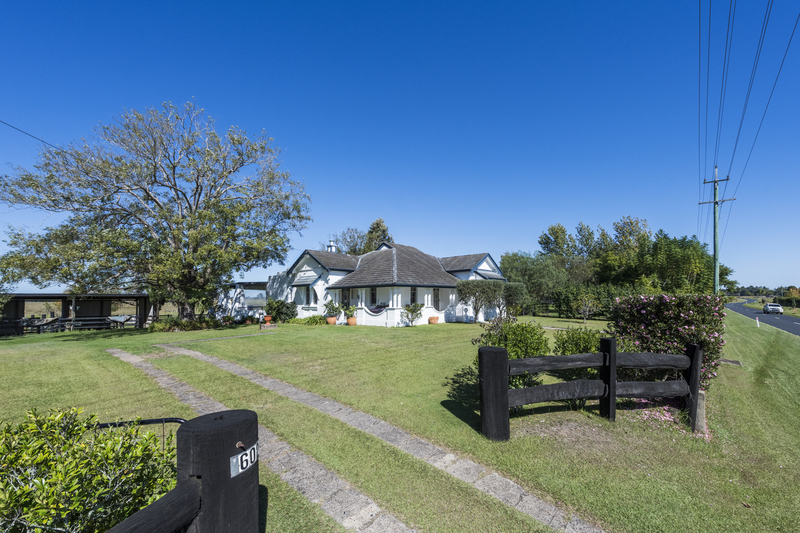 The property enjoys the benefits of being located close to an appealing regional city while retaining the peace and serenity you would expect to find surrounded by wide open spaces and history. When it comes to modern rural living, “Southgate” certainly has it all. *Auction cancelled. Price on Application. Inspection by appointment only; contact David Farrell (0437 448 455) or JoJo Newby (0417 690 637) of Farrell McCrohon Stock & Station Agents to arrange your inspection.